As the Advent season is once again upon us, the editors are pleased to publish a new issue of Contemporary Church History Quarterly. For many of us—editors and readers—the encounter between German Christianity, whether Catholic or Protestant, and Adolf Hitler’s National Socialist regime is the defining event of the twentieth-century history of Christianity. As usual, this subject stands at the centre of our work at the journal. What strikes me as interesting are the ways in which the reviews and notes in this issue expand the boundaries of that story—chronologically, thematically, and geographically. The Cecilienstift in Halberstadt, which hosted a recent workshop on Protestant institutions in the Third Reich. Image courtesy of FrankBothe (Own work) [CC BY-SA 4.0 (https://creativecommons.org/licenses/by-sa/4.0)], via Wikimedia Commons. Mark Edward Ruff’s new book, The Battle for the Catholic Past in Germany, 1945-1980, reviewed by Robert P. Ericksen, asks why Catholic Christians came under scrutiny for their behaviour during the Third Reich long before Protestants, whose record was ultimately more troubling. It serves as the springboard for an expansive study of Catholic controversies about the Church in the Nazi era, from early triumphalist interpretations through various legal struggles, the uproar over Rolf Hochhuth’s treatment of Pope Pius XII, and on to cross-confessional debates between Klaus Scholder and Konrad Repgen in the 1970s and 1980s. Heath Spencer then reviews Joachim Negel and Karl Pinggéra’s Urkatastrophe. Die Erfahrung des Krieges 1914-1918 im Spiegel zeitgenössischer Theologie. This survey of a broadly European (with a nod to global) array of theological responses to the cataclysms of the First World War, spanning from justifications of the conflict to Christian pacifist rejections of violence. What emerges is a picture of the extent to which the war provoked theological crises, some of which led to renewal and others of which continued to play out in encounters with totalitarianism, war, and Holocaust. Lee B. Spitzer has written a detailed account of US Baptist responses to Jews and Jewish persecution and annihilation in the Hitler era, showing how events in Germany preoccupied North American Christians as well. As expected, Spitzer finds a mixture of responses—some ambivalent, others sympathetic, though none practically effective in ameliorating the crisis faced by European Jews. Beth Griech-Polelle reviews The Evil that Surrounds Us: The WWII Memoir of Erna Becker-Kohen. Kohen, a Jewish-German who married a Catholic and subsequently converted, wrote of her day-to-day experiences in Nazi Germany. Her account, edited and translated by Kevin Spicer and Martina Cucchiara, reveals the sharp limits and high costs of the “protected status” of Jewish Germans married to “Aryans.” Though filled with disappointments and struggles, her memoir also reveals the potential of faith to sustain hope. The shorter notes which follow these reviews continue to expand the story of Christianity’s encounter with Nazism and the Holocaust, assessing Protestant responses to Allied occupation, Romanian Catholic conversion of Jews, and Protestant institutional life in the Third Reich. 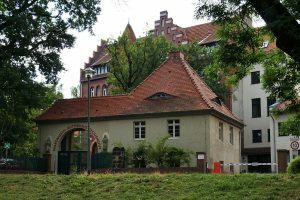 Finally and most broadly, Mark Edward Ruff reports on recent scholarly engagements around questions of nineteenth- and twentieth-century Christian revivalism in Germany. We hope you find these contributions interesting, and we appreciate your continued readership.